For small modern computers, see Small form factor, nettop, etc..
A minicomputer, or colloquially mini, is a class of smaller computers that was developed in the mid-1960s and sold for much less than mainframe and mid-size computers from IBM and its direct competitors. In a 1970 survey, The New York Times suggested a consensus definition of a minicomputer as a machine costing less than US$25,000 (equivalent to $161,000 in 2018), with an input-output device such as a teleprinter and at least four thousand words of memory, that is capable of running programs in a higher level language, such as Fortran or BASIC. The class formed a distinct group with its own software architectures and operating systems. Minis were designed for control, instrumentation, human interaction, and communication switching as distinct from calculation and record keeping. Many were sold indirectly to original equipment manufacturers (OEMs) for final end use application. During the two decade lifetime of the minicomputer class (1965–1985), almost 100 companies formed and only a half dozen remained. When single-chip CPU microprocessors appeared, beginning with the Intel 4004 in 1971, the term "minicomputer" came to mean a machine that lies in the middle range of the computing spectrum, in between the smallest mainframe computers and the microcomputers. The term "minicomputer" is little used today; the contemporary term for this class of system is "midrange computer", such as the higher-end SPARC, Power ISA and Itanium-based systems from Oracle, IBM and Hewlett-Packard. The term "minicomputer" developed in the 1960s to describe the smaller computers that became possible with the use of transistors and core memory technologies, minimal instructions sets and less expensive peripherals such as the ubiquitous Teletype Model 33 ASR. They usually took up one or a few 19-inch rack cabinets, compared with the large mainframes that could fill a room. The definition of minicomputer is vague with the consequence that there are a number of candidates for the first minicomputer. 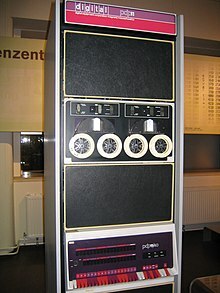 An early and highly successful minicomputer was Digital Equipment Corporation's (DEC) 12-bit PDP-8, which was built using discrete transistors and cost from US$16,000 upwards when launched in 1964. Later versions of the PDP-8 took advantage of small-scale integrated circuits. The important precursors of the PDP-8 include the PDP-5, LINC, the TX-0, the TX-2, and the PDP-1. DEC gave rise to a number of minicomputer companies along Massachusetts Route 128, including Data General, Wang Laboratories, Apollo Computer, and Prime Computer. Minicomputers were also known as midrange computers. They grew to have relatively high processing power and capacity. They were used in manufacturing process control, telephone switching and to control laboratory equipment. In the 1970s, they were the hardware that was used to launch the computer-aided design (CAD) industry and other similar industries where a smaller dedicated system was needed. The 7400 series of TTL integrated circuits started appearing in minicomputers in the late 1960s. The 74181 arithmetic logic unit (ALU) was commonly used in the CPU data paths. Each 74181 had a bus width of four bits, hence the popularity of bit-slice architecture. Some scientific computers, such as the Nicolet 1080, would use the 7400 series in groups of five ICs (parallel) for their uncommon twenty bits architecture. The 7400 series offered data-selectors, multiplexers, three-state buffers, memories, etc. in dual in-line packages with one-tenth inch spacing, making major system components and architecture evident to the naked eye. Starting in the 1980s, many minicomputers used VLSI circuits. 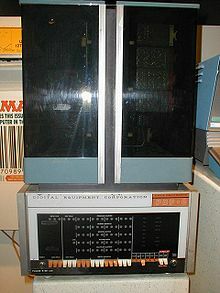 At the launch of the MITS Altair 8800 in 1975, Radio Electronics magazine referred to the system as a "minicomputer", although the term microcomputer soon became usual for personal computers based on single-chip microprocessors. At the time, microcomputers were 8-bit single-user, relatively simple machines running simple program-launcher operating systems like CP/M or MS-DOS, while minis were much more powerful systems that ran full multi-user, multitasking operating systems, such as VMS and Unix, and although the classical mini was a 16-bit computer, the emerging higher performance superminis were 32-bit. The decline of the minis happened due to the lower cost of microprocessor-based hardware, the emergence of inexpensive and easily deployable local area network systems, the emergence of the 68020, 80286 and the 80386 microprocessors, and the desire of end-users to be less reliant on inflexible minicomputer manufacturers and IT departments or "data centers". The result was that minicomputers and computer terminals were replaced by networked workstations, file servers and PCs in some installations, beginning in the latter half of the 1980s. During the 1990s, the change from minicomputers to inexpensive PC networks was cemented by the development of several versions of Unix and Unix-like systems that ran on the Intel x86 microprocessor architecture, including Solaris, Linux, FreeBSD, NetBSD and OpenBSD. Also, the Microsoft Windows series of operating systems, beginning with [Windows NT], now included server versions that supported preemptive multitasking and other features required for servers. As microprocessors have become more powerful, the CPUs built up from multiple components – once the distinguishing feature differentiating mainframes and midrange systems from microcomputers – have become increasingly obsolete, even in the largest mainframe computers. Digital Equipment Corporation (DEC) was once the leading minicomputer manufacturer, at one time the second-largest computer company after IBM. But as the minicomputer declined in the face of generic Unix servers and Intel-based PCs, not only DEC, but almost every other minicomputer company including Data General, Prime, Computervision, Honeywell and Wang Laboratories, many based in New England (hence the end of the Massachusetts Miracle), also collapsed or merged. DEC was sold to Compaq in 1998, while Data General was acquired by EMC Corporation. Today only a few proprietary minicomputer architectures survive. The IBM System/38 operating system, which introduced many advanced concepts, lives on with IBM's AS/400. Realising the importance of the myriad lines of 'legacy code' (programs) written, 'AS' stands for 'Application System'. Great efforts were made by IBM to enable programs originally written for the System/34 and System/36 to be moved to the AS/400. The AS/400 was replaced by the iSeries, which was subsequently replaced by the System i. In 2008, the System i was replaced by the IBM Power Systems. By contrast, competing proprietary computing architectures from the early 1980s, such as DEC's VAX, Wang VS and Hewlett Packard's HP 3000 have long been discontinued without a compatible upgrade path. OpenVMS runs HP Alpha and Intel IA-64 (Itanium) CPU architectures. Tandem Computers, which specialized in reliable large-scale computing, was acquired by Compaq, and a few years afterward the combined entity merged with Hewlett Packard. The NSK-based NonStop product line was re-ported from MIPS processors to Itanium-based processors branded as 'HP Integrity NonStop Servers'. As in the earlier migration from stack machines to MIPS microprocessors, all customer software was carried forward without source changes. Integrity NonStop continues to be HP's answer for the extreme scaling needs of its very largest customers. The NSK operating system, now termed NonStop OS, continues as the base software environment for the NonStop Servers, and has been extended to include support for Java and integration with popular development tools like Visual Studio and Eclipse. A variety of companies emerged that built turnkey systems around minicomputers with specialized software and, in many cases, custom peripherals that addressed specialized problems such as computer-aided design, computer-aided manufacturing, process control, manufacturing resource planning, and so on. Many if not most minicomputers were sold through these original equipment manufacturers and value-added resellers. Several pioneering computer companies first built minicomputers, such as DEC, Data General, and Hewlett-Packard (HP) (who now refers to its HP3000 minicomputers as "servers" rather than "minicomputers"). And although today's PCs and servers are clearly microcomputers physically, architecturally their CPUs and operating systems have developed largely by integrating features from minicomputers. In the software context, the relatively simple OSs for early microcomputers were usually inspired by minicomputer OSs (such as CP/M's similarity to Digital's single user OS/8 and RT-11 and multi-user RSTS time-sharing system). Also, the multiuser OSs of today are often either inspired by, or directly descended from, minicomputer OSs. UNIX was originally a minicomputer OS, while Windows NT kernel—the foundation for all current versions of Microsoft Windows-borrowed design ideas liberally from VMS. Many of the first generation of PC programmers were educated on minicomputer systems. ^ Huang, Han-Way (2014). The atme AVR microcontroller : MEGA and XMEGA in assembly and C. Australia ; United Kingdom: Delmar Cengage Learning. p. 4. ISBN 1133607292. ^ Estabrooks, Maurice (1995). Electronic technology, corporate strategy, and world transformation. Westport, Conn.: Quorum Books. p. 53. ISBN 0899309690. ^ Smith, William D. (April 5, 1970). "Maxi Computers Face Mini Conflict: Mini Trend Reaching Computers". The New York Times. ^ Bell, Gordon (9 January 2015). "Rise and Fall of Minicomputers". Engineering and Technology History Wiki. Retrieved 28 January 2017. ^ "Minicomputer". Britannica.com. Minicomputer... the term was introduced in the mid-1960s. ^ British DEC employee John Leng reported: "Here is the latest minicomputer activity in the land of miniskirts as I drive around in my [Austin] Mini Minor." ^ "Rise and Fall of Minicomputers". ^ "Case study of a microcomputer-minicomputer link - Science Direct" (PDF). ^ Ranging from the CDC 160 circa 1960 to the DEC PDP 8 circa 1965 Lafferty, Stephen H. (January 2014). "Who Built The First Minicomputers?". Retrieved 24 January 2014. .
^ "The LINC: An Early "Personal Computer"". DrDobbs.com. ^ "What Is the Difference Between a Microcomputer & a Minicomputer". ^ "7400 Series TTL". Radio-Electronics.Com. ^ Nicolette Instruments Corporation (February 1, 1972). "Nicolette 1080 Series, Data Acquisition and Processing System, Description and Specifications" (PDF). Retrieved May 28, 2016. ^ "History of Computers in Education". ^ Dan Ryan (2011). History of Computer Graphics: Dlr Associates Series. ISBN 1456751158. Wikimedia Commons has media related to Minicomputers.